What a year it has been! This year started off relatively slow for my photography, but ended with one of the best trips I have had for Florida bird photography opportunities. As is my tradition, this article will take a look at what I think were my best images for the year. I hope you enjoy it! I start with #1 being my best image. 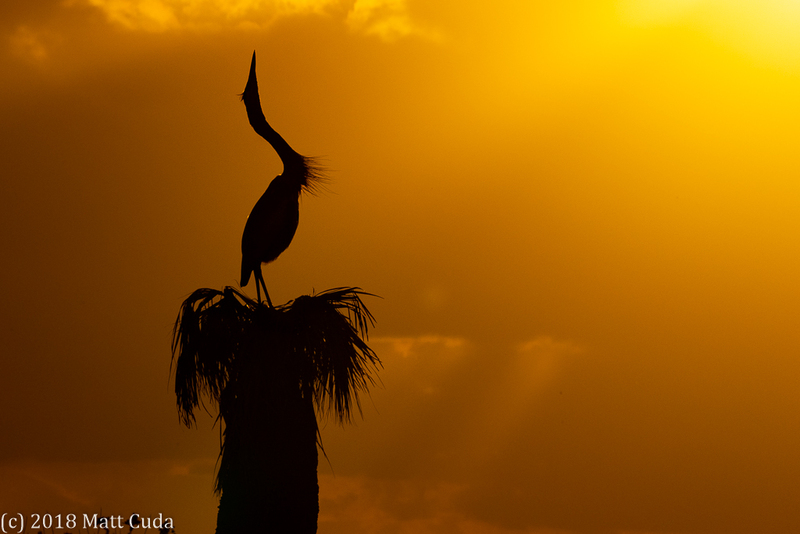 A highlight to this year, was a week of photographing birds along the space coast of Florida. This photograph was from that trip. I particularly like how the heron was stretching his neck in this photograph to provide the perfect pose for this sunset silhouette. Beams of light shoot through openings in the clouds to provide a great supporting backdrop. Even when photographing captive birds, it is very difficult to get a good flight shot where everything comes together as it should. 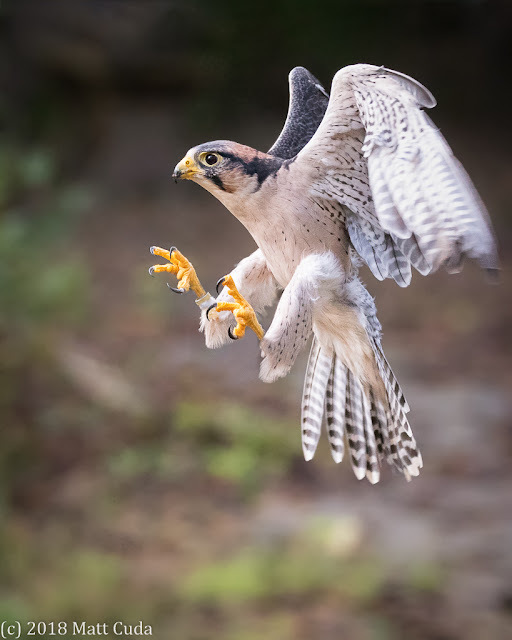 In this shot, the falcon is moving very quickly, and the shot was taken just as he began to pull back to make a landing. 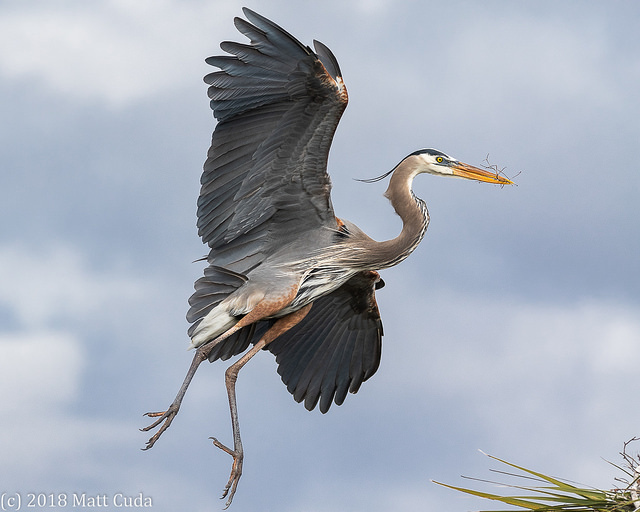 The second great blue heron to make the list and the second from my trip to Florida. Here, the heron is taking twigs to his new nest. Although some might consider this a fairly common shot, I still think it deserves 3rd in my overall list of images for 2018. Of course, the twigs in the bill and the wing position help to make this shot a good one. This was a tough one as there are probably two that could have taken #4. In the end, I ended up choosing this, because it has so many elements going for it. First, snow is always a crowd "pleaser" and here, we have snow falling and an inch or two built up on the log the blue jay is perched on. Secondly, the jay is compressed into a defensive position and warning off other birds from his food source. 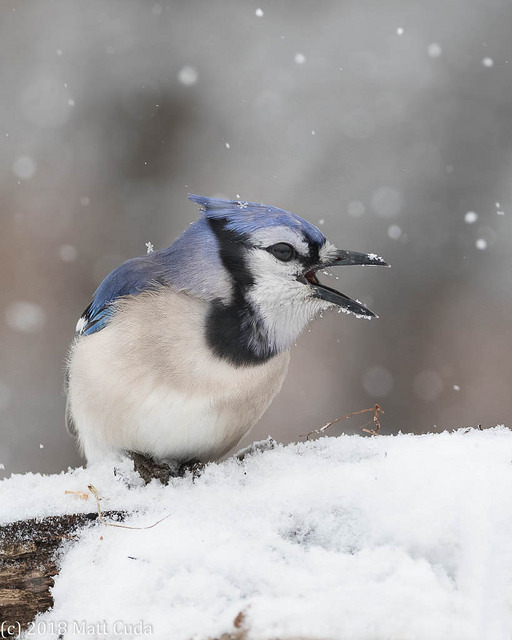 This shows the harsh realities of winter for songbirds throughout the mid-Atlantic and northeastern states. It is hard to not have a nice reflection shot in the top 10. 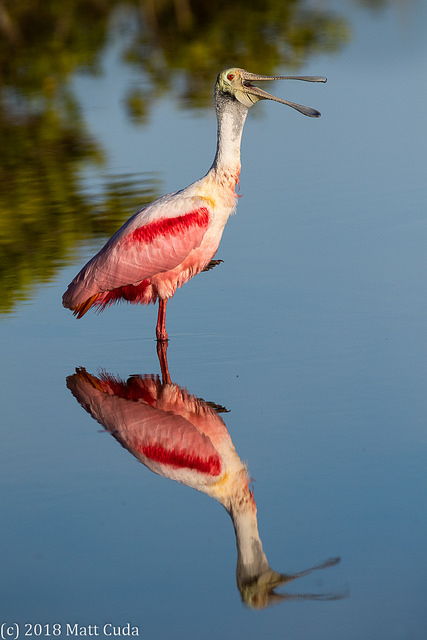 Again, a Florida bird is part of the top 10 with this roseate spoonbill. First, I like the reflection in this shot. The sharpness of the reflection is paramount with shots like this and this is best achieved by shooting the subject on perfectly still water. Next, this bird is giving us gesture by opening his mouth. FInally, the morning light really ads texture and color to the image. If it had just been the reflection, it may have not made the list at all. First, I love the framing in this shot produced by the light green early spring leaves. 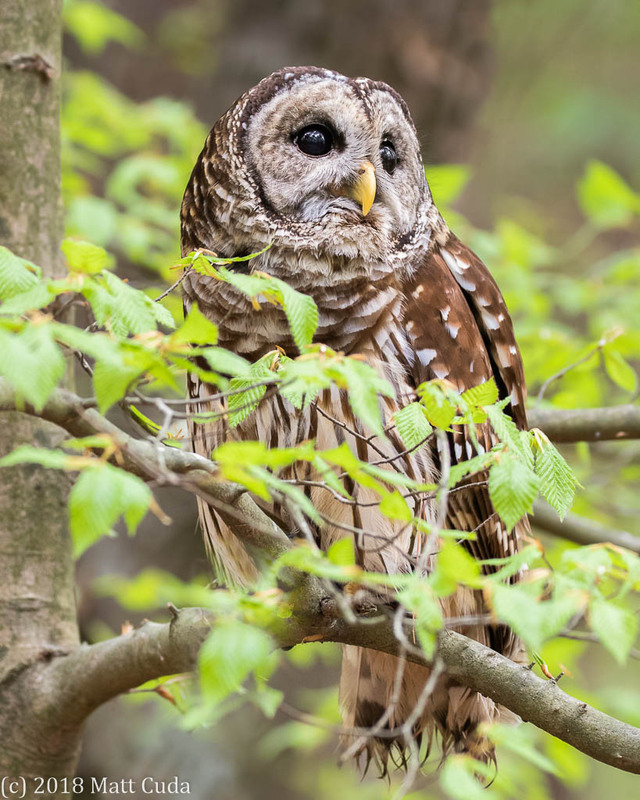 Next, the owl appears as if he is posing for a portrait as she looks off into the distance. There is just something about early spring that makes everything come alive in an image. Despite this being a captive owl, I firmly believe it needs to be in the top 10. Remember, a good image is a good image despite where it was photographed. Don't let others take that away from you! Reddish egrets are one of my favorite birds, so maybe I am a little biased here. Watching them dance about in order to scare their prey into making a horrible choice is very interesting to watch. This is a fairly common shot for many, but a first for me. 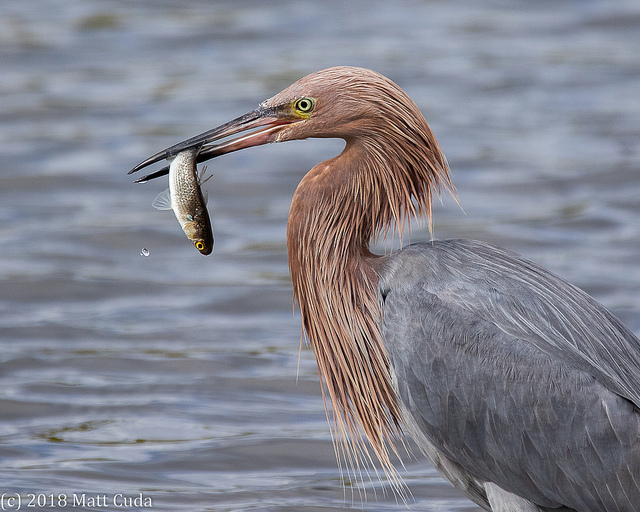 I do have other images of birds with fish, but here I like the position of the fish in relation to the bill. 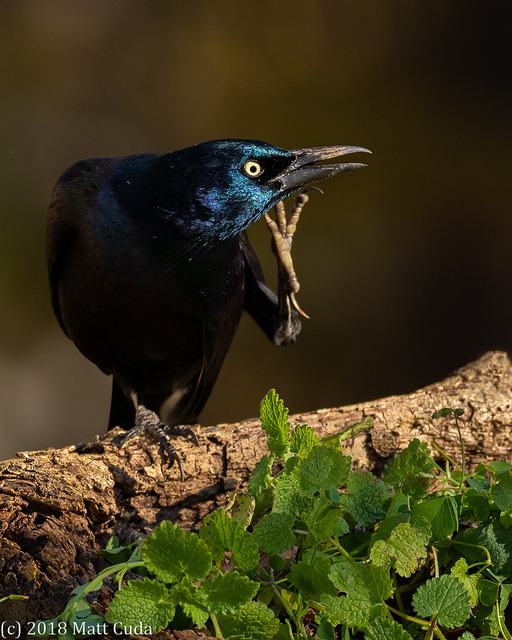 Let's face it, grackles are common, aggressive and frankly a general pain in the behind. I like this shot because it takes such a common subject, puts it in good lighting, a good set and performing an activity that makes the viewer interested in this bird. That is really an accomplishment for wildlife photographers. It isn't always what you can do with a fascinating subject, but rather what you can do with a boring one. 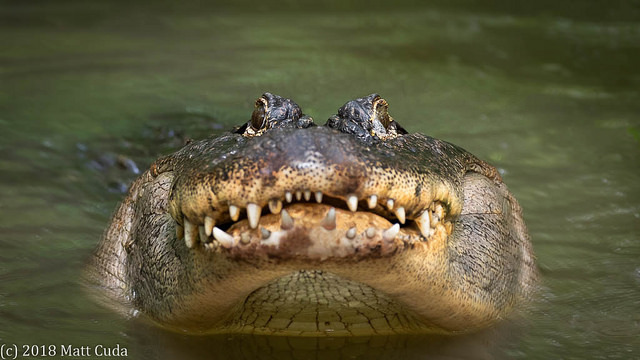 Alligators bellow during the mating season to attract mates, and to fend off intruders. While at the zoo, this massive alligator decided he was not happy with my camera rattling off shots. He turned, quickly letting off several massive grunts of anger. The vibration of the water can be seen in this shot as it was only 1/125th of a second shutter speed. There were 4 photos I was considering for the tenth image. This slot is always the toughest to decide on because of this. In the end, I ended up going with this macro shot of a Canada goose feather. 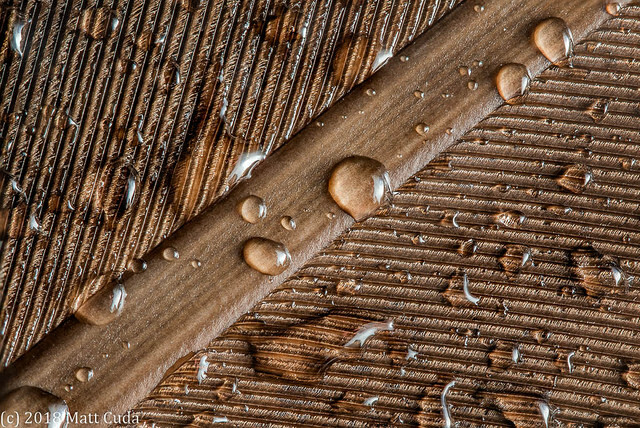 I like the extreme, greater than life size magnification, and the water droplets. I hope you enjoyed this years top 10 list. I encourage you to do the same with your images as it is a great practice to help you decide what you did right and what you need to improve on for 2019. One of the biggest areas that I see new wildlife photographers struggling in is that of taking shots of birds in flight (BIF). Birds move so quickly and, in many cases erratically, that it often leaves even the most seasoned pro feeling physically and mentally drained at the end of a day. He may go back to the hotel with only a few sharp shots and in some cases, none. Photographers spend thousands of dollars to buy the perfect camera for birds in flight and yet still have trouble making it work. Photo Gear Designs believe they have the product that will give you a fighting chance at making great BIF images. I should also note that I do not work for nor am I affiliated with Photo Gear Designs. Firearms have had a sighting concept known as a red dot sight for many years. This sight is used to paint a battery powered, illuminated retical inside the scope so the shooter can better, see where he is aiming the rifle. You can think of a retical as just a fancy, illuminated cross hair sight. Wouldn't it be nice if we photographers had that same technology applied to what we were trying to do? Well, we in fact do! 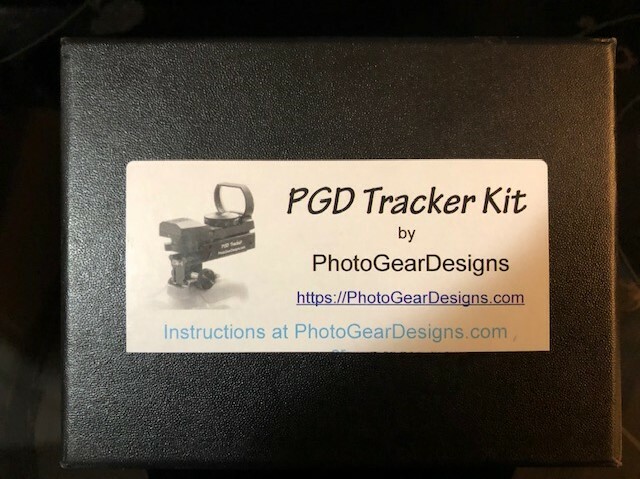 It is called the PGD Tracker by Photo Gear Designs. About 6 months ago, I received one of these devices from Photo Gear Designs for testing and writing a review. So I finally got around to testing it at a fairly demanding Florida location. Specifically, I tested this in the Merritt Island area of the space coast on a couple different subjects. I will break down the review into a similar manner to my other reviews. First, I will look at build quality, next, ease of use and finally the results of the test. The PGD tracker has a very sturdy build and appears to be fashioned from an alloy of some type. Perhaps it is aluminum alloy. It comes with a hex wrench for easily calibrating it to the camera, a small nylon pouch to carry it in, batteries, lens cover, and a cleaning cloth. 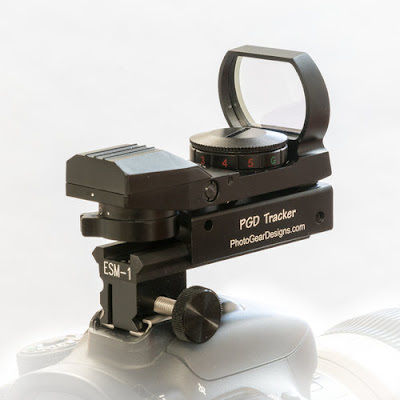 Attaching the PGD Tracker to the hot-shoe of the camera was simple. It just slides into place and is locked down by an easy to use and locate knob on the right side of the rig. Actually it locks down easier than a flash. There is a switch on the back of the device for changing which type of retical you would like to use and another rotary switch on top for selecting the intensity of the retical light in the view finder. This switch also acts as the on/off switch. The aiming retical can be seen clearly in this view. Simpy put your subject in the middle, depress the shutter button halfway and fire away. I want to be clear that you cannot simply take this out of the box, drop it into your hot-shoe, and start firing away. It must be calibrated to your specific camera and lens combo by using the windage and elevation screws on the back of the device. There is an easy to follow PDF on how to do this on the company's web site. It only took me about 15 minutes, and I was up and running. You can view the instructions here. I would also take it a step further and say that you should check to make sure it is in calibration before going out each time. I noticed it was no longer sighted in on my second trip out. I had to make some minor adjustments. In talking with the folks at PGD, I was told that it shouldn't fall out of alignment very often. My guess is I was banging it around pretty good in the car and as I walked. Again, not a big deal, but something you have to think about. If you want to practice your flight skills, there is arguably no better place to go than Florida. There are no shortage of birds that will line up to have their photographs made. From challenging fast flying terns to plummeting ospreys, your patience and photography skills will be put to the test. That is where I decided to test this device as I thought it would be the most fair and balanced testing. Before shooting for the day, I made sure it was calibrated by focusing on a small stationary object. The target was a 7 inch icon on a sign at about 15 feet away. After making some minor adjustments, I was off to shoot. 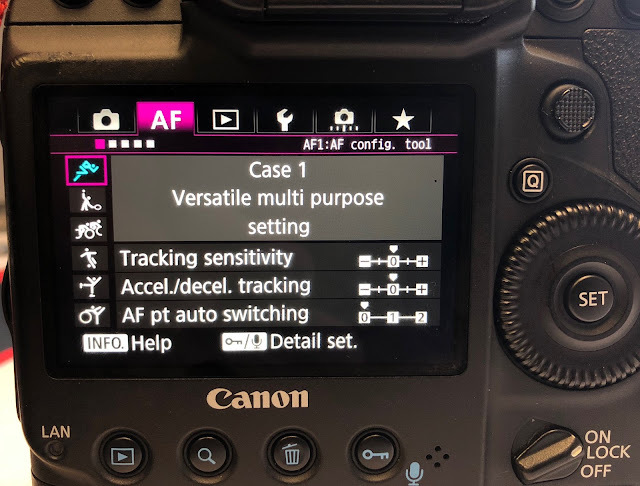 Before shooting, I selected the center autofocus point on my 7D Mark II, Case 1 in my autofocus setting and AI servo mode for constant focusing. I primarily used the three point hold and extended hands free mode in my testing as outlined on the product website. The beauty of shooting with this setup is you are free to pickup and track the subject in a more relaxed and natural manor. You are not looking through a 600mm lens where you can easily loose the subject. Instead, it is like aiming a rifle or pistol. 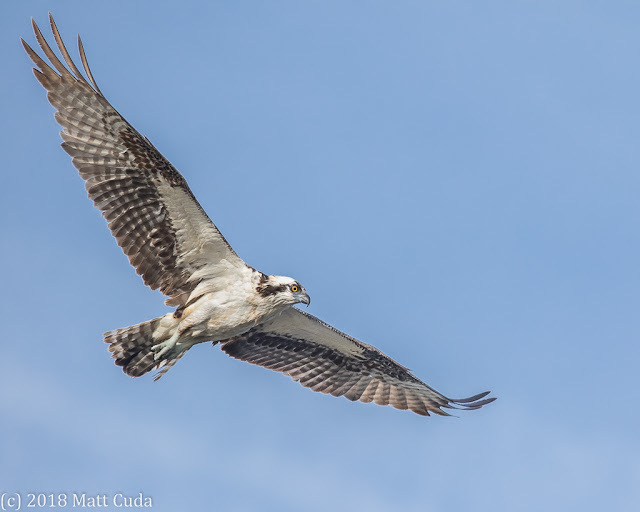 The first subject I tested heavily with the tracker, was a "flock" of three ospreys circling one of the lakes on the famed Blackpoint Wildlife Drive. Here I got to spend about 20 minutes tracking with the device and shooting. At first, I used just the center point autofocus, but found that it was not locking on quite enough for my taste, so I switched to center point expand using 8 surrounding points. This seemed to offer the best compromise. Below is a shot of one of the ospreys using this technique. Later that day, after shooting the ospreys, I moved on to the beach and began to photograph shorebirds and terns in flight. 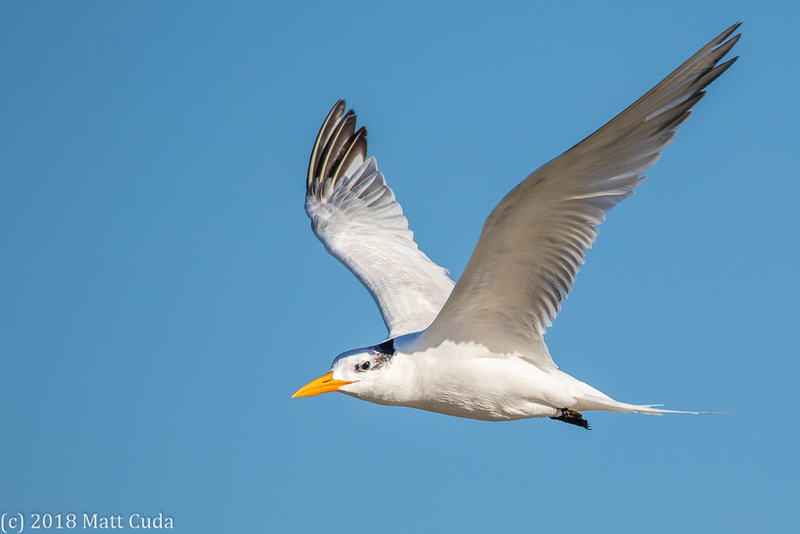 Terns are a good bird for practicing BIF. They are faster and more maneuverable than many birds and are generally in abundance at certain locations. Again, during this test, I used the center point expand and also tried using the center zone approach. Both approaches yielded good results. Below is a tern I photographed. OK, so it worked, but not everything is perfect, right? Well, yes, there are a couple issues with this type of setup. One of the biggest issues you will run into is not knowing that you are actually locked onto the bird. You may be focusing, but you are assuming you have a good lock. I had probably a dozen images where my camera grabbed the background, but there was no way for me to know. Another question you might ask is: did you have a greater amount of keepers? Well, honestly, I did not notice any more keepers than normal, but realize I have been shooting for some time and have really honed my skills over the years. It certainly was more convenient to shoot. The other issue, which is petty at best, is that it does not have an auto-shut off to keep the battery from running down. I would like to see it shut off after 8 hours. After speaking with PGD, I was told this feature would increase the cost of the product. This is not a deal breaker, but rather, just a nice to have feature. Easy to leave the unit on and run the battery down. There is no auto-shut off. This is certainly a unique and innovative product, but can it really help, will I use it, and is it worth $175? In short, yes, yes and yes, but let me explain a bit more. The reality is that there is no silver bullet. If you are buying this thinking you are going to be the next Art Morris, then think again. This product is a tool or aid to help us realize our vision. It is a clever piece of machinery, and when used properly could indeed help you. Now, in my case, I would keep this mounted and ready to shoot at a moment's notice. I see this is as a tool to get quick, unexpected shots that I could not get looking through my lens. It most likely would not replace the view finder, but be used as an aid. For those that no longer have the reflexes or perhaps have weaker vision, I can see this being the only BIF tool they use. 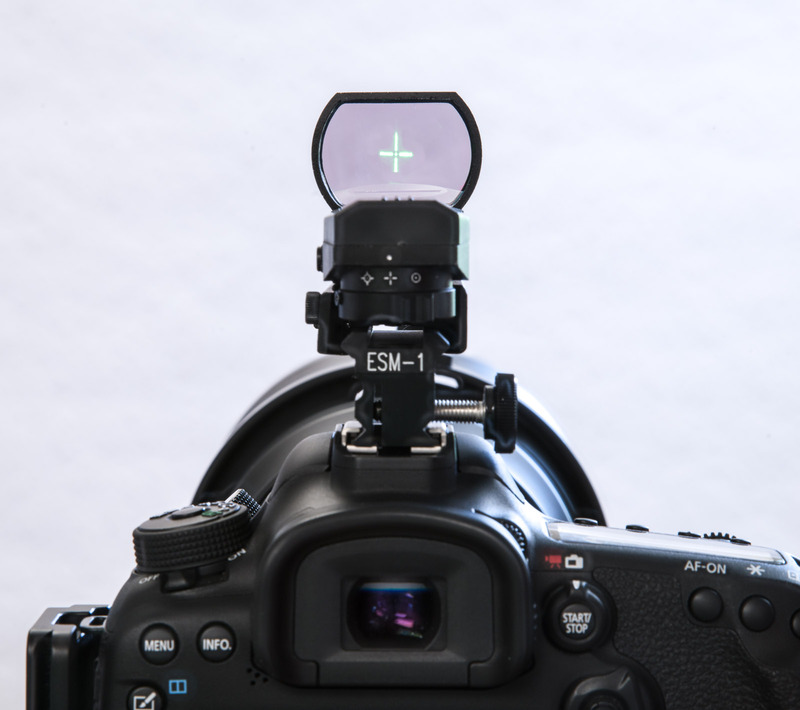 It does work, and if you have to, you can use the entire center zone selected on your camera to aid in focusing. I would encourage folks in this category to really think about purchasing the PGD Tracker. Now, the price. Is it worth $175? For a tool that is this specialized and is not produced on a massive scale, I think the price is very reasonable. In short, if you can swing the price, you should pick it up. Even if it helps get you two or three shots you wouldn't have been able to get before, then it is worth the price. I keep hearing many rumors regarding the possible release of the Canon 7D Mark III, but before I speculate as to what I think the new camera might look like on a spec sheet, I want to redirect you to what the Canon CEO explained to us at the beginning of this year. Furthermore, there were other quotes which talked about Canon halting development on some products in order to reevaluate and determine what the next steps were. I personally believe that the Canon EOS 7D Mark III design and prototyping was halted in order to determine if it was cutting edge enough and what the future might look like for the camera. As far as announcements, I personally feel like we are looking at Q1 of 2019, but who knows, I may be surprised. With all the talk about Canon's new mirrorless offerings, one simply has to wonder which camera will be next. Will the 7D Mark III be the next mirrorless? Personally, I don't think so. Since the 7D Mark III is the flagship APS-C camera and utilizes the same autofocus system as the 1 Series cameras, I think it will become mirrorless within the same time frame as the 1 Series bodies do. They will be the last to go mirrorless. What will the Specs Look Like? We can all sit here and make our predictions and let's be honest it is fun to do that. So why should I be any different. In light of the CEO's announcement above, here are my latest predictions. No AA filter - I would love to see this, but I am skeptical. Personally, I think this will be the last 7D series to include a mirror. The 7D Mark IV will be mirrorless as well as the 1DX Mark IV. I think this will be a move that is not only expected by the shooters, but one which Canon has to embrace to continue to be a major player in the marketplace. The 7D Mark III will not have any features that are earth shaking, but I do think that finally we are are going to see a camera that has had significant enough upgrades to be considered a win by most. This will be the last flagship body to receive the 4K upgrade and it is needed by many. Don't look for huge gains in image quality, but expect to see better noise performance and a huge boost to AF speed. If they remove the AA filter, the image quality will increase also and that could be a huge win for Canon. I do think this upgrade will be worth moving up from the Canon 7D Mark II for those who are looking to take advantage of the newer features. I think the AF system alone will be worth the upgrade for wildlife photographers. I started out in digital photography with the purchase of the Canon EOS 1D Mark II many years ago. That camera quickly became my go to camera for just about everything, including birds in flight. To this day, that body has a special place in my heart as one which could take abuse, and never fail. Of course until it did fail, and then I had to replace it, but I digress. 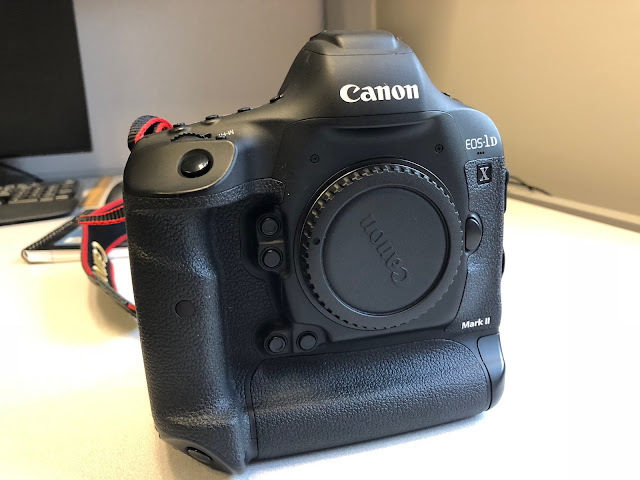 For those who have not been initiated into the deep line of Canon cameras, the 1 Series (as it is known), is the flagship DSLR in Canon's line. It has been a go to camera for the worlds best sports and wildlife photographers. Indeed, every camera I shoot with, I compare to this line. I am taking a break today from lens reviews to review the Canon EOS 1DX Mark II. 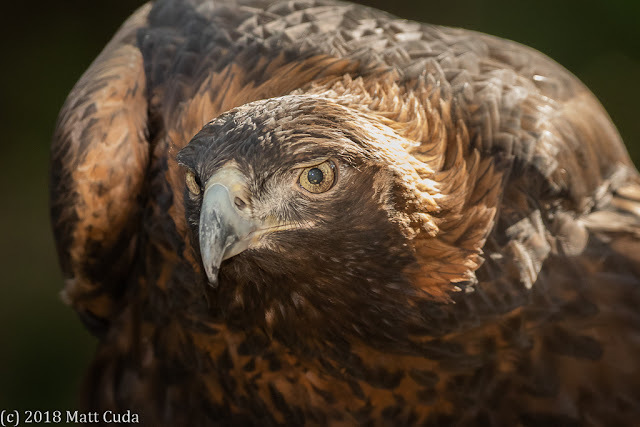 I will look at fit and finish, capabilities, image quality and the most brutal test of all, birds in flight. So sit back in your arm chair, grab a cup of Joe and get ready to experience the best of the best Canon has to offer. AF points now can be setup to be red instead of the darker black/gray color in the Mark I. The 1DX Mark II boasts a fully weather sealed and dust sealed magnesium alloy body. Over that body is what appears to be a rubberized type of material which includes anti-slip surfaces for gripping the camera better. The camera felt like it was made for my hands and as I shot with it; it felt like an extension of my hand. There is certainly no room to complain with how this body is built. It was built for the discerning pro or advanced amateur looking for a no excuses experience in photography. Some may find the weight to be an issue with this camera as it comes in at 2.95 lbs. Let's just say it weighs 3 lbs and be done with it. It is a heavy camera, and it seems a little heavier than some previous models. For example, my older 1D Mark II came in at 2.7 lbs and my 1D Mark III is only 2.5 lbs. When shooting birds in flight hand held, I had to stop often to let my shoulder rest. This is a common issue with the 1 Series line, and if the situation permits, I would invest in a gimbal head for the flight shots. However, the weight is not all bad. A heavy camera can produce more stable shooting as it can help balance heavy lenses. At one point during my testing, I was able, quite by accident to discover just how rugged the housing of this body is. During the shoot, one of my tripod legs slipped and down went the body. It landed in the dirt with a thud. My heart sank; I walked over to the now muddy body, cleaned off the back of it and resumed shooting. No ill effects were noted for the rest of the shoot. That is one tough body! Let me say that I was totally blown away by the autofocus of this camera. I was able to shoot birds in flight with little difficulty and even in low light. The camera locked on to my subject quickly and stayed locked. For the majority of my shooting, I stuck with the general purpose setting on the AF modes. In this mode, I did find it would grab the background quicker, but that might be what you want. There are many modes to choose from, and you can easily tailor the camera to what your needs are. Huntersville, NC - Lanner Falcon, Sigma 150-600 C @ f5.6, 1/1250th of a second, ISO 8000. Using center point expand autofocus. Autofocus points can easily be moved using the joystick on the back of the camera, or if you prefer, using the standard wheel and dial approach. I found both methods to be quick and painless. It should also be noted that I did dial in a -1 micro-adjust focus correction when using my Sigma 150-600. If I were to complain about anything on the autofocus side of things, it would be the lack of autofocus points near the edge. When I was shooting static subjects, I often wanted to move up past the autofocus cluster to focus on my subject's eyes. This is one area that the 7D Mark II excels over the 1DX Mark II. The photographer almost has edge to edge autofocus points on the Canon 7D Mark II due to the smaller sensor size. A myriad of autofocus options are available on the 1DX Mark II. I used Case 1 for my testing. I also primarily use this mode on my 7D Mark II. At only 21 megapixels, Canon was making every attempt to make this camera a low light monster. 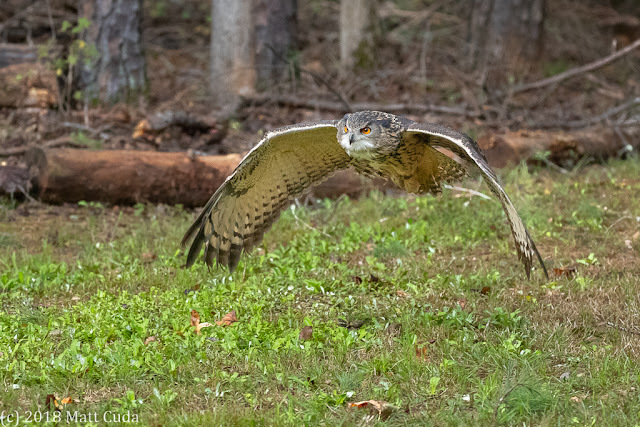 When shooting birds in flight, I started shooting at 8:00 am in a forested area. This is a low light time in the autumn season. I was able to shoot without difficulty at ISO 8,000 and still have usable shots. When shooting static subjects I dropped back to ISO 6400 to produce very usable shots. Compare this to my Canon EOS 7D Mark II and I would definitely be in trouble at 3200 and above. This camera saved my bacon on this day. The shot below was taken at a whopping ISO 20,000. Although I would not try to make large prints from this shot, it does show just how versatile this camera is. Huntersville, NC - Eurasian Eagle Owl, Sigma 150-600 C @ f5.6, 1/1250th of a second, ISO 20,000. Using center point expand / AIServo autofocus. I hesitated to even write anything on image quality because at this price point, it better have astounding image quality, but I decided to go ahead with my thoughts on it anyway. 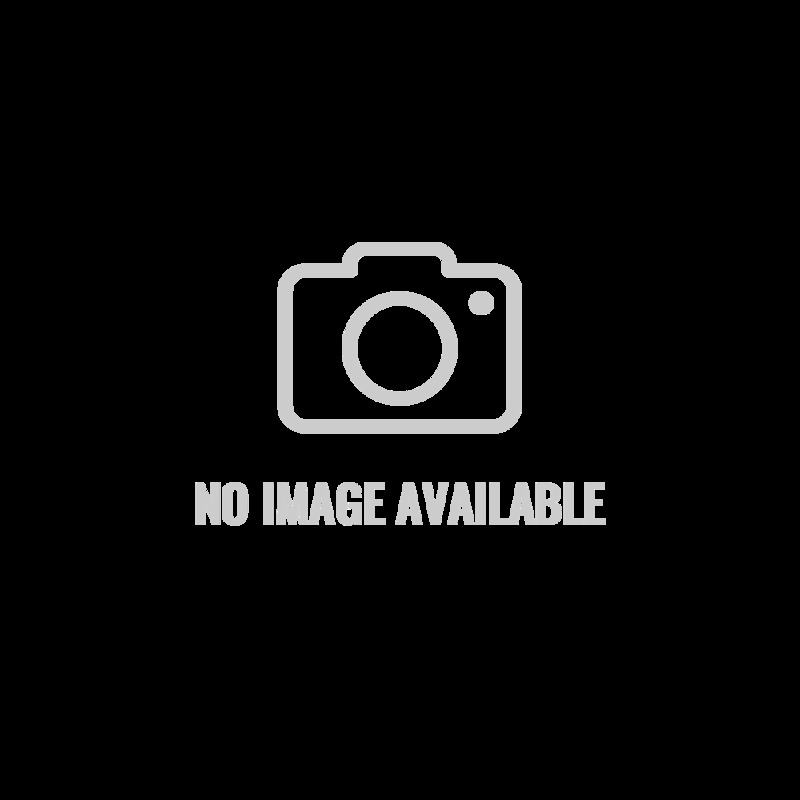 It, of course, has amazing image quality. I found the level of detail to be more than enough and the "cropability" of the final product to be just as amazing. Meaning that even after cropping, I felt like the final product held good detail. However, because of the low light work I was doing, I was not able to test it at 100 ISO. I think at that level I would have been completely blown away. Even at ISO 3200 though, it was astounding. Much better than my crop sensor bodies (of course). Below is a static shot of a golden eagle photographed at 3200 ISO using fill flash to bring out facial detail. I would have no issues with making 30 inch images even at this ISO. Huntersville, NC - Golden Eagle, Sigma 150-600 C @ f6.3, 1/250th of a second, ISO 3200. Using single point/AIServo autofocus. Where I found the image sensor lacked was in dynamic range. I thought it did a fair job in the shadow detail, but I found that recovering highlights was only slightly better than my 7D Mark II. This is something I am hoping Canon can correct in the near future. My Canon 1D Mark III can recover highlights that would never be recoverable with modern cameras. The newer and higher megapixel sensors simply cannot recover these highlights (with maybe the exception of the higher end Sony cameras). I did shoot three videos over the course of a weekend of shooting, but shooting video was not my primary goal with this test. However, let me say that shooting video was much better than it is on my 7D Mark II due to the touch screen autofocus. I could easily touch anywhere on the LCD and shift focus from one object to another. This ability would also make special effects like pull focus possible. This camera also supports 4K at 60 fps, which is welcome, as Canon has been slow to provide this to its non-cinema lines. Now, if slow motion is your primary style of shooting, you will only get 120 fps at 1080p. Seriously though, If you are that into video, and want to stick with Canon, either get a dedicated cinema DSLR or get one of their professional video cameras. I will address the video shooting more in my podcast and YouTube channel. The autofocus is completely stunning and took even me a little by surprise. For that reason alone, I highly recommend this body. I may even pick one up on the used market myself in a few years just for flight. If you are only interested in image quality and have no need for fast action photography, I would look at the Canon EOS 5D Mark IV or maybe even an older 6D. So, 6,000 dollars? Is it worth it to you? My advice to you, if money is an obstacle, is just to wait until it comes down on the used market. In a few years, this camera will be down below $1,000 US and will be a great bargain. If you want a camera with similar functionality and don't mind giving up the full frame sensor, consider the Canon EOS 7D Mark II which can be picked up on the used market for under $1,000 US. Although the 7D II isn't quite as performant on the autofocus side, it has amazing detail and most of the features this body has to offer. If you want to stick with the 1 Series bodies, but can't afford this body, consider a used 1DX or 1D Mark IV. You will have to drop down to 18 megapixels on the 1DX and 16 on the Mark IV, but I can tell you they have amazing autofocus and image quality. In the end purchasing a camera like this is about weighing the pros and cons for your style of photography. No one can tell you what your needs are, but I hope this helped you to understand who this camera is for, what features it has and what kinds of trouble you might run into.